Le Club AccorHotels has launched their “Back Friday” offer that is valid for stays consumed between November 24 – January 31, 2018. Le Club AccorHotels members that register for this offers and book between November 24 – 27 can earn 500 bonus points for each of their stay during the promo period. There are some issues with the T&Cs that are attached to this offer that only refer to one stay compared to the promo text itself that refers to stayS. Both cannot be correct. I believe that they have used incorrect T&Cs template. 1. 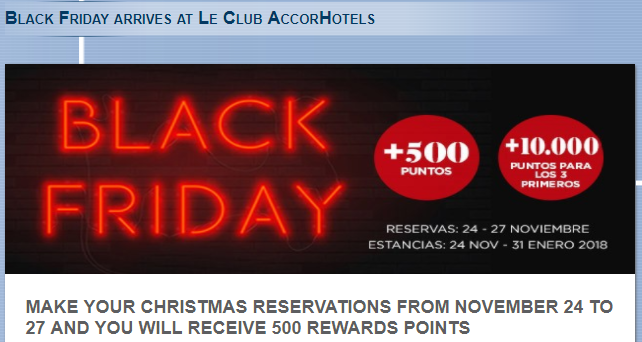 The terms and general conditions of Le Club AccorHotels apply to the offer [Black Friday 2017] and it is necessary to be a member of Le Club AccorHotels in order to benefit from it. 3. This offer allows members of Le Club AccorHotels, regardless of their status, to earn  Rewards points for a stay at one of the hotels participating in the Le Club AccorHotels loyalty program. These extra Rewards Points are offered in addition to the Rewards Points and Status Points normally earned by Le Club AccorHotels members at their eligible stay and according to the terms and conditions of use Le Club AccorHotels. This promotion does not apply to stays at the partner hotels of the Le Club AccorHotels program. 4. Offer valid only  times / times by each partner during its validity period. 5. The stay must be booked with the tariff [trade name of TK]. If the rate is not available, the member will not be able to benefit from the offer. 6. This offer is valid for a stay of [24-11-2017] until 31-01-2018] in one of the participating hotels, which has been booked between [24-11-2017] and [27- 11-2017]. 7. The stay must be for a minimum of  night (s). 8. Consecutive stays (check-out and same-day check-in) in the same hotel are considered simple stays. This simple stay will be eligible only once in the offer [Black Friday 2017]. 9. Within the framework of this offer, a stay is defined as one (1) reservation made by a member Le Club AccorHotels, regardless of the number of rooms in the same. The reservation made by a partner for several rooms will only be counted as one (1) stay. 10. To be eligible for this offer, rooms must be booked through AccorHotels distribution channels (AccorHotels websites, AccorHotels mobile applications, AccorHotels reservation center, hotels) and traditional travel agencies using a GDS automatically connected to the AccorHotels reservation center. Therefore, you will not be able to enjoy this offer if you have booked your stay through a reseller, a tour operator or a third-party travel agency (such as expedia.com, booking.com, etc.). 11.You must indicate your Le Club AccorHotels loyalty card number when making your reservation and present it at the hotel reception when you check-in. 12.The Le Club AccorHotels Rewards points will be charged to the member’s account within 10 days of the date of the end of the stay at the hotel. 13.This offer can not be combined with other promotional offers or current advantages and does not apply to groups. 14. Stays paid in full or in part with Rewards points will not be eligible for this offer. 15.Shipping subject to availability. The general terms and conditions of sale apply to the specific public rates of each hotel. Previous articleReader Question: Does Avianca LifeMiles Block Award Availability Of Several Star Alliance Airlines Again?